Those who seek political office appear to be eager to break the moral code that most of us are willing to follow. The greater the power of the political office that a candidate is seeking, the more likely it is that that individual has no sense of right and wrong. The analysis above is a watered down version of the median-voter theorem. Candidates of both parties need to get the support of the middle-of-the-road voter, the “median” voter. Linking voting to patriotism or claiming that practicing democracy is equivalent to living in a free country are also successful tactics. Of course, such statements are false, but many people still fall for these claims. It helps that the government schools reinforce these ideas and teach students that it’s their civic duty to vote. After years of hearing this propaganda, many people will accept this position. History shows that this works. I have not signed any contract as such, but there is such a common/absurd belief that is dooming mankind. And, when I make the voters to think I feel like I am administering medicine to a dead person. The political system is filled with many strident lies. The banking system is easily manipulated. The social system is highly hallucinated. And, you, dearest voter, confidently believe that the election system cannot be esoterically plotted by any concocter at all? Strange. To think skeptically is a punishment, because I have to deal with the zombies around me who do not know to reason. They say, “Voting makes a difference”, “vote for a change”, etc but I have not understood hitherto that “if voting could change the things then why politicians have not made it illegal?” What majoritarians simply do not understand is that 80% taking away the rights of 20% through the means of voting is highly unethical and unjust. Voting is a form of splendid insanity, and to vote for change is like repeating insanity in order to expect different results. No amount of voting will discard dangerous ideas like eminent domain, social contract, legal robbery (taxation), sociopolitical intimidation, etc. In wrestling, out in front of the people, we make it look like we all hate each other and want to beat the crap out of each other, and that’s how we get your money, [and get you to] come down and buy tickets. They’re the same thing. Out in front of the public and the cameras, they hate each other, are going to beat the crap out of each other, but behind the scenes they’re all going to dinner, cutting deals. And [they’re] doing what we did, too — laughing all the way to the bank. And that to me is what you have today, in today’s political world. What you fail to realize with your real eyes is that all the political parties are two different sides of a same coin. As Election Day nears, get-out-the-vote frenzy is entering high gear, trying to browbeat voters into exercising their franchise with various arguments. Unfortunately, those arguments reflect seriously flawed logic. “If you don’t vote, you don’t have a voice in government.” This is one of many arguments based on the false premise that your vote will affect what passes and who wins. But your vote will not change the outcome. You will prosper or suffer under the same laws and representatives whether you voted for the winner or the loser, or didn’t vote. “If you don’t vote, you don’t care about India.” No amount of care justifies voting if that vote doesn’t alter the outcome. “It is your duty to vote.” Voting is a citizen’s right, implying the right to abstain, not a duty. I have a right to become drunk, divorced and destitute, but that does not give me the duty to do any of them. And if one is not highly informed on an issue, as is true of most, casting an uninformed vote is more a dereliction of duty than a fulfillment of it, contributing nothing valuable to electoral results. “You must vote, because the electoral process would collapse if everyone chose not to vote” Beyond the insignificant probability of everyone abstaining, this is just the common “if everyone” fallacy. Unless your voting choice alters many others’ choices about whether and/or how to vote, which is unlikely, this is irrelevant to whether you should vote (though politicians must, to be taken seriously, as witnessed by the harassment given to any candidate who ever failed to vote in previous elections). Do the many invalid “get-out-the-vote” arguments imply that you shouldn’t vote? No. But it implies that you shouldn’t vote for invalid reasons. For instance, since your one electorally insignificant vote will not change the result, voting to transfer others’ wealth to you is simply a morally offensive but ineffective attempt at theft. 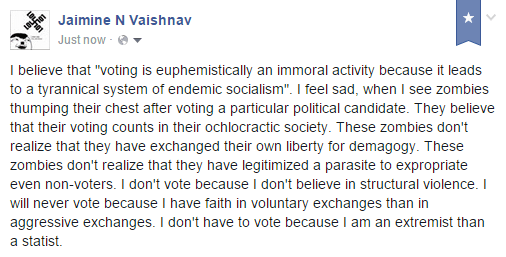 Similarly, choosing to vote despite massive ignorance produces no benefit to you or society. The basic reason is that I see no reason to engage in a morally dubious practice when it doesn’t even yield any pragmatic benefits. For example, if I take the wheel of a runaway bus, and I can swerve to kill 3 people instead of the 30 in the path of the bus, then maybe I go ahead and do it. Sure, I feel bad about killing 3 people who otherwise would have lived, but I understandably could “pick the lesser of the evils.” Yet that’s not what happens if you vote for someone you think will violate property rights and order the deaths of innocent foreigners. Here, your vote is not reducing the number of people killed (unlike in the bus story). Whether or not you vote for the “lesser evil,” the same person will become president and will go about doing a whole bunch of evil. So there is no practical reason for you to join in, and thus you might as well save yourself the inconvenience of waiting in line at the polling booth. Businesspeople, if they are successfully “greedy” become rich by providing their fellow citizens (i.e., consumers) with things that make them better off. In other words, they have to earn it. But many who espouse that people don’t need more than a basic level of existence, in their own greed, constantly vote for politicians who will take money from others and give it to them. They, just like the businessman, want more than they currently have. But instead of earning it as the businessman or capitalist does, the socialists steal it from those who have more. The businesspeople’s actions are moral (unless they earned their money by theft or by being given privileges by government), while theirs are not. The sad fact is that this is exactly what our political system — democracy — is all about. It is a system where the masses, those with less money than the minority group that has great wealth, vote for politicians who offer to take money from the wealthy minority and redistribute it to them in return for giving the politician their votes. Voting wealth out of the pockets of those who have it is socialism, because it is done for the “common good,” for the benefit of helping that part of society that earns less. This is why democracy has been likened to two wolves and a sheep voting on what to have for dinner. This is also what is known as “social justice.” Politicians are simply people who learn to be good actors in order to win your vote. They ultimately care little about real progress for the country or the lives of individuals; they care about their political careers. Wealth redistribution, therefore, is theft. It is the taking by force from one group in order to give to another. Force is involved because anyone who fails to pay assessed taxes — confiscatory taxes that mostly go directly into someone else’s pockets — will be put in prison. People from whom money is taken have not usually voted for this action, but those who wanted to receive others’ money usually have voted to take it from them. Many socialists will dispute this and argue that most people want to pay the amount of taxes they pay. Wealth redistribution does not involve only social programs such as welfare, Medicaid, and Medicare. It involves any occurrence of one party receiving money, physical goods, or services, that they did not pay the full cost of, but that another party did, on their behalf. For example, public transportation involves wealth redistribution because most that use it did not pay for the bulk of the cost. Even though they contribute by purchasing their tickets, the ticket is highly subsidized because wealthier taxpayers fund most of the cost. We can see from these statistics how absurd is the phrase “tax breaks for the rich.” The rich do indeed benefit most from tax breaks because of the fact that they pay most taxes. Tax breaks are the giving back to the rich some of the money that was previously taken from them. Yet socialists call this redistribution from the poor to the wealthy! In other words, if the poor aren’t allowed to receive as much of others’ incomes as before, and the rich are allowed to keep more of their income, then, in the eyes of socialists, the rich are taking from the poor. This is like saying that a thief who must return a woman’s purse after getting caught stealing it is redistributing money from himself to her. When the government imposes taxes on the rich or less rich for the purposes of giving the money to another it is no different from taking his car, house, farm, or individual possessions. It is often the cases that people who inherit property from deceased family members, even property that has been in their family for generations, have to sell the property just to pay the taxes. They really do lose their physical property. Even when taxes are taken straight out of people’s salary, the monetary income taken could instead have been spent to buy physical goods or assets. It is family property that will never exist but would have otherwise. What is the morality of forcing wealth from those who have it to those who have less? How is it that people are outraged when a CEO steals from his company, or a street thug steals a car, but they are not upset with themselves and their poorer neighbors for stealing from those who rightfully earned more money than they? Indeed they actively support such theft and vote for more of it! I conclude that society does not really care about morals. They care about what’s best for them, defining terms in different ways in different situations, to fit their own personal or ideological agenda. Socialists condemn the businessman who becomes rich by pleasing others and providing jobs for workers and who harmed no one else in the process. But socialists claim that workers (and nonworkers) who were paid the full value of their work by the businessman but still choose government force to make him pay more, are innocent, righteous, and deserve “social justice.” As a reminder of why businesspeople take nothing from others but simply benefit from creating wealth for them, consider the fishing net example from chapter 1 of The Case for Legalizing Capitalism: If an island businessman creates a fishing net, he is able to reap the reward of more fish (more wealth). If he sells the net to others, he becomes wealthy by exchanging fishing nets for money (which exchanges for wealth). With others having a net, too, they can have more fish at lower prices (fewer hours of labor). Plus, those who help the fisherman make nets get paid wages in the process. The businessman creates wealth for everyone without taking from anyone in the process. Everyone benefits! Suppose your family decided to start a business. You invest time, sweat, money, and opportunity costs in creating a new product or service. Your company’s product did not previously exist, but you made it available for others, without harming or forcing anyone to exchange their income for the product. After some years, your product becomes so popular that your family has now become wealthy through voluntary exchange. Others, who engage in forceful, not voluntary, exchange, in their jealousy, use the government to regulate you. They force you to sell part of your company to your competitors (antitrust legislation) who are not able to compete as efficiently and effectively; they force you to pay your workers more than you can afford (union legislation); they force you to sell your product for a lower price than the market demands and for a lower price than you would like (price controls); they force you to produce in a way that pollutes less but raises your costs and reduces your output; they then impose a “windfall-profits tax” because they think you’re earning too much money this year. Your company started out being your private property that benefited society, but then society — through government regulation — took control of it and sucked it dry. Now your family earns less, your workers earn less, and less of your product is available to consumers, and at a higher price. The consumers got what they voted for. Voting for the government to improve one’s life almost always results in the opposite. Voters are eleutherophobic. Principled promotion of ideological change is the way forward. Once libertarian ideas take hold and sweep through the ranks of the thoughtful set, there will be no need for access to the halls of power. The parasitic state will slough off of society like so much dead skin. The most effective way to promote liberty today would be to choose to abstain from voting and to tell everybody about that choice. Let me tell you, the work of is crucial. This is important. This is more important than all political action. We have to change people’s hearts and minds, and their understanding of free markets and individual liberty. That’s how we can change the world.